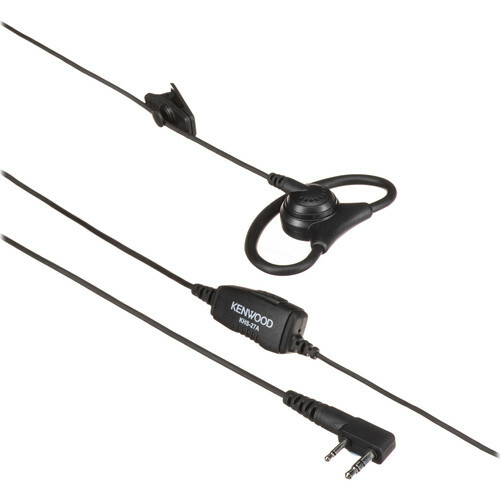 The Kenwood Model KHS-27, D-Ring Headset with In-Line Push-to-Talk Mic features a soft rubber D-ring ear loop hanger with speaker. The ear loop can be worn on either ear. Box Dimensions (LxWxH) 7.25 x 5.05 x 1.0"
Model KHS-27, D-Ring Headset with In-Line Push-to-Talk Mic is rated 2.6 out of 5 by 5. Rated 5 out of 5 by Miles3 from Comfortable and ckear We have tried a variety of different headsets for our school use walkie-talkies. Thanks to the sales rep at B & H, we now have exactly what we wanted! They fit comfortably and have a great sound. Rated 1 out of 5 by Anonymous from Poor quality We purchased 3 headsets, 1 did not work and the staff complained that the other 2 were very uncomfortable. We ended up returning all 3 headsets and purchasing new ears from another manufacturer. Rated 5 out of 5 by PL from Great headset Love the sound, doesn't seem fragile. Fit is tight (it's new) so I am hoping it will loosen a bit with wear.